Established in 2007, the GTU’s Center for Islamic Studies (CIS) educates scholars and students of Islam and other faiths about the richness of the Islamic tradition and the diversity of Muslims. The Center for Islamic Studies generates innovative research and scholarship on Islamic texts and traditions in contemporary contexts and emphasizes study and dialogue within and across religious traditions, where pluralism, interreligious understanding, and public engagement are the basis of scholarship and service. The Center offers a Certificate and Master's degree in Islamic Studies, supports Islamic studies in various GTU doctoral departments, and provides graduate level courses on Islam for students throughout the GTU consortium. In addition, the Center for Islamic Studies sponsors conferences, symposia, workshops, and research projects to foster scholarly exchange and to build bridges of understanding across religions and cultures with the wider public. Events sponsored by the CIS attract more than 7500 attendees from local and international communities each year. 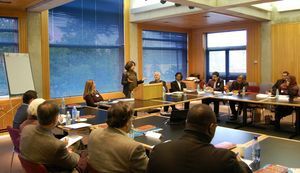 The Center for Islamic Studies works collaboratively with a wide range of partners, including many departments and centers at the University of California, Berkeley, expanding the resources available for classes, research, and public programs. A recent study estimated that 250,000 Muslims from a variety of ethnicities and countries of origin now live in the San Francisco Bay Area, within an hour's drive of the GTU campus, making the GTU the perfect platform for deepening engagement with Islam in an interreligious context. The Center for Islamic Studies at the Graduate Theological Union is uniquely positioned to build bridges of understanding and dialogue within and across religious traditions, through informed scholarship that fosters balanced perspectives and invites deeper conversation. The CIS promotes the positive impact of religion on society and the role of Islam and Muslims in building the greater good throughout the Bay Area, across the nation, and around the world. The Center also serves as a liaison with local Muslim communities and study centers, sharing resources in interreligious education and dialogue, and religious leadership.